Have the U.S. and Europe Helped Arm and Empower Islamist Militants in Syria? Nouri Fonas and I, March 9, 2011. We found these boxes of ammuntion in the destroyed Rajma base, along with 60mm mortar tubes from WWII. 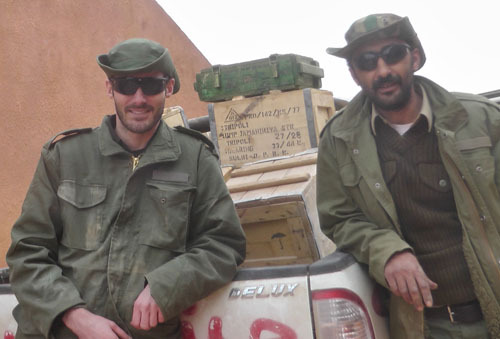 Most of the weapons used by rebel forces were captured from Gaddafi's army, including my AK-47, FN FAL, and DShK machine gun. One of the primary arguments against arming the Syrian rebels is that their lack of organization and centralized command means that the weapons could fall into the hands of Islamist militants and terrorists in their ranks. This argument is based on a combination of various influences – legitimate concern, an inability of CIA and State Department analysts to think outside the cubicle, groupthink in policy circles, and a natural aversion to such a politically risky policy. This timidity and lack of leadership will ensure one thing: that Islamist militants get weapons. And he who controls the weapons controls the revolution. The rebels will get weapons from other sources. It is in our interest to buy influence and favor with them by supplying the weapons ourselves. Syrians will become more religiously radicalized the longer the war continues, as the suffering and death tend to make people more religious during war and potentially susceptible to extremist ideologies. The sooner the rebels receive the weapons, the sooner the war will end, reducing the impact of this phenomenon. Without conventional weapons the rebels may have no choice but to resort to bombings, including suicide bombings. This will spur radicalization, spread knowledge of explosive methods and technology, and turn Syria into a training ground for a new generation of terrorists. Islamist militants will be among the first to die in the war anyway because they actively seek martyrdom. Even those with second thoughts at least believe that God will protect them, which significantly diminishes their capacity for self-preservation on the battlefield. I witnessed this on occasion when I was fighting in the Libyan civil war. Supplying weapons through the SNC will allow the SNC to control the flow of weapons and ammunition to the Free Syrian Army (FSA) and other rebel groups. Conditions can be placed on the SNC for the receipt of arms and its members can be held accountable for which rebel units receive weapons. Foreign advisers can also be on the ground and blacklist certain units from receiving weapons as a condition of supplying the SNC. Most importantly: Islamist militants are very good at acquiring weapons on their own through networking with terrorists and insurgents from Iraq and elsewhere in the region. By not supplying the rebels ourselves we are increasing the importance and influence of Islamist militants by making the Islamists the main players in arming the revolution. I initially wrote these six points in response to an inquiry on a LinkedIn forum by a colleague asking for my opinion on arming the rebels because of concerns that they are becoming radicalized. A week after I wrote my response on the forum, Reuters published an article that confirms this is exactly what is happening in Syria. Recently there have been a series of terrorist attacks by Islamist militant groups within the Syrian revolution. These groups are gaining influence and becoming key players in the revolution because they can claim tactical victories against the regime. Rebels using conventional and guerilla tactics have been far less effective lately against Assad’s overwhelmingly better equipped military, supplied by Russia. Unless the rebels are supplied with the weapons and ammunition they need to wage an effective insurgency, the revolution will be increasingly in the hands of the Islamist militants. By not supplying the SNC with arms, the U.S. and Europe are essentially arming and empowering these Islamist militants. We are on a collision course with the realities of the Arab Spring. It is time to take the wheel and do what we do best in the Middle East: buy influence with weapons and money. 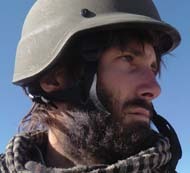 Matthew VanDyke is the American who fought in the 2011 Libyan Revolution against the Gaddafi regime. Captured by Gaddafi's forces on the battlefield during a recon mission, he spent nearly 6 months as a prisoner of war before escaping from prison and returning to the rebel army and combat on the front lines. After they won the war in Libya, he turned his attention to Syria. His documentary film about the Syrian Revolution titled "Not Anymore: A Story of Revolution" won over 100 awards. An award-winning documentary film about Matthew VanDyke, Point and Shoot, was released in 2014. In 2014, VanDyke founded Sons of Liberty International, an innovative security firm that provides free military training and advising to communities threatened by terrorism and insurgency.